On my first bike tour in 2001, the only electronic device I carried with me was a camera. And not even a digital camera! It was a 35 mm camera than ran on one battery and used actual film. It’s hard to believe that was only seven years ago. The world has definitely changed since then, and I now carry a whole host of electronics devices with my while I’m out on the road. While I could get away from using all of these devices, I like to take them alone because they make me more comfortable while I’m out on my bike. My cell phone allows me to call my friends and family (which helps me keep in touch and keeps me motivated). My Palm Pilot allows me to listen to music, watch movies, send emails, and surf the Internet (allowing me to take a break from the bike trip for a while). And my digital camera allows me to take hundreds (or thousands) of photographs, so that I can come home and share my trip with you and countless others. Today I have posted a video about the electronics I carry with my on my long distance bicycle trips and given some tips on how to keep your electronics safe while out on the road. Below the video you will see a breakdown of each electronic device I carry with me and a detailed account of why I use that device and how I keep it safe and charged while out on the road. Over the years I have experimented with a number of different electronic devices and the ones listed below and featured in the video are osimply the ones I am using at this point in time. I expect these devices to change as time goes on. 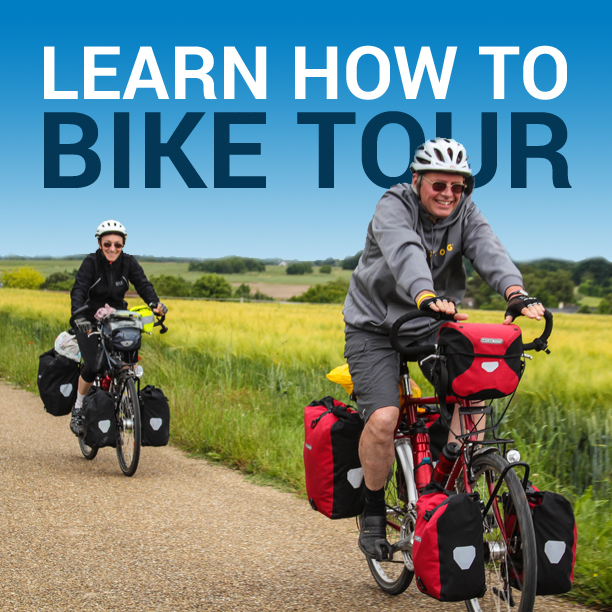 Digital Camera – With the right digital camera and a memory card large enough for your personal needs, you can capture your epic bike tour with little or no fuss. I currently have a Sony Cybershot DSC-W7 . It has 7.2 Mega Pixels and records photos on a Sony Memory Stick . The reason I bought this camera is because of it’s batteries! It uses normal AA batteries and not the lithium batteries that you find in video and most new digital cameras. The reason I don’t like lithium batteries for use on a bike tour is that once the batteries run out, you have to charge the battery, and most of the time, when the battery runs out, you are in the middle of nowhere and you certainly don’t have 4 hours to sit around while your battery recharges. In my case, when my batteries run out, I simply pull two spare rechargeable AA batteries from my pack and stick them in my camera and I’m ready to go. I use rechargeable batteries so I don’t have to constantly be buying new batteries while I’m riding… and this strategy has worked wonderfully for me over the years. (If you get rechargeable batteries, you’ll also need to bring a lightweight battery charger with you.) Be sure to keep your camera in some sort of protective case and be extra careful not to get your camera wet. Cell Phone – A cell phone is something you certainly don’t need to bring with you, but I’m sure that most modern bicycle tourists are carrying a phone with them. Bring it for safety or simply bring it to keep in touch with your friends and family. If you plan to bring your cell phone, don’t forget the charger. And if your cell phone or the charger you currently have are incredibly large, consider getting a smaller device. 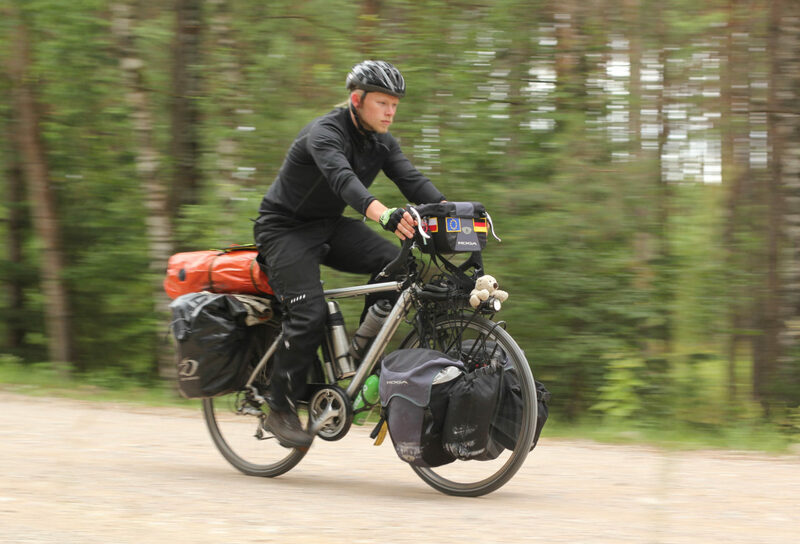 When you’re traveling by bike, the size and weight of every item you carry is extremely important. MP3 Player – Your MP3 player is definitely not a device that you have to have with you on your bike tour. In fact, I’ve only toured twice with musical devices and have barely used them while out on the road. The only time I use them is when I am on long stretches of road, there are no cars around, and I want to dance on my bike and have fun riding. This is probably the only time you will ever see me dancing, but having that music on while I’m riding really does make the miles go by quicker. I highly recommend that if you are planning to bring an iPod or other musical device, that you never use it when you are in a big city or at any time when you need to be aware of your surroundings. Never turn the volume up too loud and always use your MP3 player in conjunction with a helmet mirror or other device that allows you to see behind you at all times. You’ll want to be able to see and hear that car coming up behind you… so be careful. GPS – This is definitely not a necessity for your bike trip, but on my past trips overseas, my GPS has been a lifesaver. I would never bring it on a tour of the United States unless I simply wanted to have it as a toy. The GPS I use is a Garmin eTrex Legend and I would recommend it highly. There are much more sophisticated models, but I’ve found this particular GPS to be more than enough technology for my uses. (Make sure you know how to work the GPS before you leave on your tour). This device runs on AA batteries, so you once again need to bring along a AA battery charger, or be prepared to buy new batteries while out on the road. USB Stick – Before I leave on my trip, I put all my important computer files on a USB stick so that if I need to access the files while I am out on the road, I can go to a library and get to the files in a matter of minutes. I have a PNY 8 GB USB 2.0 Flash Drive . I recommend that you get the largest USB stick you can afford, as you can store your photos from your digital camera on the device and thus, save you from purchasing multiple Memory Sticks for your camera. Earphones – If you do bring an MP3 player (like an iPod or Palm Pilot), you are are going to need a good set of earphones. However, I recommend not purchasing the best earphones you can get, as I have ruined numerous pairs of earphones when I accidentally turned my head the wrong way while riding my bike (forgetting the earphones were still in my ears). The earphones then fell out of my ears and dropped down into the spokes of my wheels where they were instantly destroyed by the momentum of my own bike. AA/AAA Battery Charger – If you’re anything like me and you have a number of devices that run on AA or AA batteries, then you are going to either need to purchase a battery charger , or you need to be prepared to buy new batteries as you ride. There are a number of chargers to choose from, but you need to try and find the smallest and lightest one you can possibly find. Rear Bike Light – I’ve found that it is completely unnecessary to ride with or even carry a front bike light. There will likely be few times on your tour where you will be riding at night and, even if you do ride at night, you can use a headlamp (strapped around your handlebar bag) as you front light. Because I feel that a front light is unnecessary, I only carry a rear bicycle light that runs on AA batteries. There are a number of lights to choose from. Find on that is small, lightweight, and fits on your bicycle. Headlamp – I have a Petzl Tikkina Headlamp which runs on three AAA batteries and is probably not the best headlamp in the entire world, but it’s inexpensive and gives off more than enough light to read at night, set up camp, cook in the dark, or signal for help. I also use the headlamp as the front light for my bike if I do happen to find myself riding in the dark. Worldwide Power Adapter – If you are planning a trip overseas, you may need to purchase and bring along a worldwide power adapter for your various electronic devices. If you are planning a tour overseas, be sure to look into the power outages of each of your devices. Many power adapters act simply as adapters and not as converters. An adapter simply allows you to plug a US plug into a European plug (or vice versa), but the power supply will remain different. If this is the case, you may need to purchase a power converter in addition to the adapter. I’m not an electrician and I don’t have a whole lot of experience with this, so you’re going to want to do your research. I’ve only blown up one device while traveling in Europe and I can only assume it was because I wasn’t using a converter… but only an adapter. This entry was posted in Bicycle Touring Pro Articles, Featured Articles, Featured How-To Articles, Main Articles, Planning, Products, Tech, Videos and tagged bicycle cell phone, bicycle electronics, bicycle gps, bicycle odometer, bicycle speedometer, bicycle touring electronics, cell phone, digital camera, GPS, how to electronics, how to pack for a bicycle tour, iPod, MP3 player, Palm Pilot. A suggestion about carrying extra batteries. Wrap new or fully charged batteries in a rubber band. Keep drained batteries loose in whatever baggie you’re keeping your batteries in. That way there is never a question which are fully charged and which are drained batteries. Learned that trick from Randonneurs. I agree, having rechargable batteries makes sense, along with a charger. But when you are camping every night, when do you have a chance to recharge the batteries. My current charger needs at least 12 hours to work. Unless you are staying in hotels, I don’t see where you get the opportunity very often. I unfortunately do not have any experience with rider communication devices. I will certainly look into it though and discuss these devices in a future post. You can now replace all of those devices with an IPhone and a solar charger to charge your IPhone during the day while you ride. hdt, you’re right. A lot of these “old” electronic devices could not be replaced by an iPhone or similar device. I still don’t think the quality of the iPhone camera is quite up there with other digital cameras… and the phone is going to be really expensive when traveling abroad, but otherwise it’s probably a good option for many people. For my upcoming trip to Europe I am going to be taking my laptop, camera, and GPS. But I won’t be bringing any sort of MP3 player, just because it’s one more thing to charge up and carry around. Even so, consider this, they have other cell phone and PDA devices that are not necessarily seen by the general public or as popular that have powerful cameras, they have cell phone watches even. Don’t be believe me, go to whatsshopping.com. Cell phone watches, MP4 watches all of that. Most people take little note to the fact that China, who produces all of these electronics, stays ahead of the game at all times. All of these things mentioned here are obsolete. The problem with writing any article about technology is that the stuff goes out of date so quickly that you write about the newest technology today… and it’s old news tomorrow. That’s kind of how it goes. But the ideas behind the technology last a bit longer. I attach my solar battery recharger to the top of my rear rack pack when touring. This way I am charging batteries all day while I am cycling. My charger is attached via velcro sewn to the rack pack top and glued to the bottom of the charger.